If you've got a small shop, or limited space on the job, the new JET, B3NCH 8", Jointer/Planer Combo is right for you. This powerhouse has features usually only found on big floor models. Precision adjustment knobs, compact design, and a powerful 13 Amp motor are only a few features that make this jointer/planer the right choice for wherever you may need it. Dust Port: 2-1/2 in. / 4 in. Max. Cut Capacity (Depth): 5/64 in. Max. Cut Capacity (Width): 8 in. Max. Stock Removal: 1/8 in. Planing Capacity (Depth): 4-18/25 in. Planing Capacity (Width): 1/5 in. Table Dimensions: 29 in. x 8-1/4 in. Great planner and joiner for the money and being a JET always hellps. A very good purchase. Great for a small workshop. You get what you pay for. Great for mid to lite work. Have already done several projects. Very satisfied ???????????? I used this tool very little. In fact, in the 5 years I had it, it had no more than 4 hours of use. The good thing about it is it's an all in one machine.It did what I needed and I never over worked it. It could handle most lumber I used. But don't expect the thickness planer to give you accurate cuts because it won't. It's just not that accurate. You have to keep measuring over and over and over. Then last night I was making my last pass with a piece of 3/4 walnut and the motor slowly began losing power until it finally died. I just think an expensive piece of equipment should last longer than 4-5 hours. I have a smaller shop, so having a compact tool that an serve two purposes is very important. It fits under a cabinet well, but does not really have a good place to grab it, so I end up tipping the jointer to get my fingers under it. worked fine the first time I used it. descent for what it is. If you are limited on space, this is the machine for you. I like that I can move it into the driveway with ease. That allows me more room in my small garage to go from the planer to the table saw. You cannot compare this machine to full size single purpose equipment. For what it is and what it cost it is a great value. For home use with limited space this fills the need. It is easy to set up and use, small enough to keep out of the way and has the power to do the job. I like this little workhorse... It suits my needs. Like many woodworkers I have a small shop (9 x 16'), and being retired, a small budget. I make wooden boxes so a small machine suits my needs and being a benchtop machine, I can move it around to use it where convenient. What I do require is a certain amount of precision. I knew that I couldn't afford a separate jointer and a planer. That would cost $700+ for each machine. The Jet JJP-8BT seemed a perfect match for me. So, I checked it out and read the reviews. Boy, do the reviews vary - From one star to five! From a piece of "junk" to "love this combo". The Jet JJP-8BT, to me, was made for the "Joe homeowner" hobbyist or part-time, semi-professional such as myself. If you're working with small lengths of wood or working on an occasional project or two, then this machine serves a good purpose in your shop. Most reviews center around expectations, experience with such machines and technical know how. I buy and dimension a lot of rough cut lumber to make my boxes. I also have a neighbor that owns a small sawmill. Until now, it has taken days to sand re-sawn wood to get the smoothness I need as I didn't have a jointer or planer... I think you see where I'm going. My big concern before I bought this machine was whether it could be adjusted so that the in-feed and out-feed were co-planar. I had downloaded the manual and it showed no such adjustment. I read the reviews and it was one of the biggest complaints. But, the techies out there said there was a means to do this. I bought it. I received the machine and mine WAS one of those that had a 1/16th of an inch dip in both the in-feed and out-feed tables towards the chipper head (but I was prepared for that). This made the knives high by that amount. I put a board through it right away as a test (is it good right out of the box), big snipes and a convex cut. But...Once properly adjusted (you can call the Jet technicians and get the photo/instructions on how to do this), the knives came into perfect adjustment and it definitely meets my expectations. I ran a group of various types of cupped, warped and rough boards of different types of softwoods and hardwoods through it. I've had no problems what so ever. I did receive the unit missing the knife adjustment guage and the dust port had a knob that was broken off. I epoxied the knob, called Jet and the guage and new dust port are on the way. Jet has great technical people. I worried about the combo just having a two knife cutter but at the rpms this runs at and taking small cuts with proper feed speed, I've had no problems... On the contrary, it has met my expectations or exceeded them. There were no nicked knives as others have found. And, the knives didn't clog with wood shavings... Probably because I connected it to my shop vac. Having the dust port on the machine is a must as it won't start without it being properly installed for each of the two operations, but you MUST use a vac if you don't want the cutter head to be bogged down with a lot of shavings. A 30 inch deck is a space saver but not what you might be used to if you've been using a single unit jointer. I ran a couple of 6 ft boards through using a roller on the out-feed end and had no problem. My neighbor brought over a 4x4" 10' chunk of cedar that he had milled from the trunk of a tree. With him manning the out-feed end me at the in-feed, the planer was a champ. He was impressed. If I were to do that myself, I think I would add weight to the stand I have it bolted to. I've had no problem planing 1/16" stock using an auxiliary bed to make the planer table thicker and even did a bit narrower board by double-sided taping it to a thicker board. It didn't do that great, but was worth the try. 1/16" is as much as I will ever ask it to do. The pros are that when properly adjusted, this 8 inch jointer/planer combo will meet the expectations of those needing a small space saving machine that has the versatility to get the job done right and it meets the requirements of a machine of its type and intended use. It is not for the professional woodworker or for heavy usage. The con of this machine is the poorly written manual that doesn't give you all the info you will need to get this machine to work to your satisfaction. As with most inexpensive pieces of equipment, this is not an out of the box machine. You must put in a few minutes effort to get it to work maximumly. I like this machine. It works better than I imagined for my situation. I would recommend it to others whole heartedly as long as they are aware of its limitations and are willing to take the 10 minutes to adjust it to their needs. My first Jet product, and will not be my last. Very productive for small planer. I was impressed with the capability of this small unit. I used it to plane rejected cedar pickets to make interior cedar paneling for my grandson's club house. It planed the 6 in. wide boards one after another and did a great job. I'm adding on to home and using cedar.This machine does a good job jointing and planing boards.I seen the reviews on this machine and the only thing I didn't like was the adjustment knob on top has to be removed before using.It is what it is.Cost was reasonable and the free shipping was a great bonus. First, I must brag on CPO; I ordered this jointer online at 4:00 PM on 12/23 and it was on my doorstop at noon on the 24th. That is 20 hours! And free shipping to boot. You cannot beat that anywhere. Now, for the jointer. So far, I am impressed with the quality. I read other reviews and was concerned about it arriving out of plane or damaged, but I had no issues. I proceeded to clean the shipping grease off and assemble the tool. The only area I struggled with was getting the blade height right. It took a few adjustments and corresponding tests on scrap wood. Like any jointer, you know when you get it right; it cuts smooth and with ease. The dust port works okay. I have an excellent "yellow" planer so I only needed the Jointer set for dust collection. Even with the 4" port connected to my DC, I still had to vacuum afterward. The tool is very loud. I am already deliberate about using hearing protection, so it is not a deal breaker. However, this Jointer seems every bit as loud as my Planer. Altogether, I am pleased with the product and would recommend it to others. Easy set up. Ease of adjustment is slightly complicated by having to move outlet chute/shavings adapter from top to bottom depending on whether you are using it as a joiner or a planer. Other than that a very good product for the money. the joiner would be better if you had more adjustments for the tables. it took alittle time to set up but after it was adjusted works fine for the small size. Nothing cheap about this machine. It was fairly easy to assemble making a nice addition to my wood working equipment. I have not used it very much yet but first indications are a very strong, well built machine. The instructions drove me to give it four stars. They could use some work as I found one mislabled part and feel they favor someone who is not a novice at assembling equipment. The quality of the machine rates an A. Really left a smooth finished surface on planed wood. Plastic adjustment knobs were not a great addition. Saw dust removal for planner is a pain. Once you have the tool set up it works great. Be sure to hook up dust collection when using the planner or the chips will stack up and you will have to stop and remover them with an air hose. I am very pleased with this machine and feel I must address some of the negative reviews done that I have seen. I have heard guys complain that they had trouble running a 6' long board and keeping things straight. To that I must say: Look at the machine, the table is short. Why would you run a 6' board across this without some kind of outfeed support? I build bass guitars and don't run boards over 4' long and have had no trouble with either the jointer or the planer. The other thing is the power. To quote one review " The instructions say it can cut 1/8" deep at a pass but it bogged down when I tried to go 1/16" deep." To this I must say: It's a benchtop machine, not the 20HP planer at you local hardwoods supplier, any one who has used portable power tools like this will know that you have to take thin passes on machines like this. I am very happy with this machine, it works as good as any other brand of similar size or use. I did not like the assembly instructions but have put together enough of these machines that it didn't matter. I would recommend that Jet re-do the assembly instructions but besides that I am glad I bought this machine. Tech writer must have fallen asleep. No tally of assembly hardware. Broke knobs during second day of use. Plastic bags containing assembly parts all broken, parts everywhere. One hex screw that helps hold blade in place came stripped. Blades are hard to set to accurate heights. The out feed table for the planer is difficult to true due to the screw locations. The mount holes for bench mounting are difficult to access. This machine does work but was not well though out. All of the cut-corners definitely are reflected in the pricing. I'm still learning the basics at this point, but I believe I will get the hang of it very soon. Appears to be a good machine. Compact combo is a great idea, machine is sturdy enough to handle 8 by 2 by 4ft walnut. Tables for both tools are on the short side, hard to make small adjustments on cut depth on both tools, dust/chip collection is over engineered and flawed, it don't work. Planer table came off level by 1/16th side by side, had to disassemble the machine to calibrate it. Jointer Infeed and out feed tables came not coplanar, off by a lot! No way to calibrate any of that, had to actually modify parts to make it better. Bottom line is: you can't have a jointer and a planer for less than 1000 bucks if you want accuracy, if you are on a tight budget and don't mind fiddling with it, then this is the way to go. I just purchased this great woodworking tool to replace a double blade jointer whose blades and rotor are finally beyond repair. The planer is a bonus, but I really didn't know it was a combination when I purchased it. Vey pleased with ease of use, accuracy, and ease of table adjustment. It is light enough to move around my shop, but heavy duty enough to perform under the most demanding circumstances. The machine gives a lot of value for the money. I got a great price on mine through the CPO outlet. I am very pleased with how well the chip collector works with my shop vacuum. The machine came well packed, no parts were missing and delivery was fast. Now the bad news: The jointer tables were not coplanar when received and they took some work to get into adjustment. The fence on the jointer is not designed very well. It needs to be improved. The manual is so-so. The parts drawings in the manual are awful! Would I buy one again? Absolutly! For the money you are not going to get more machine and once tuned up it works well. Easy to set up out of the box. Blades, table and fence well aligned. Solid construction. I just put 20 BF of 8/4 Iroko through planer, jointed then thicknessed. Cuts very cleanly. Dust collector OK, hooked to 6 gal. shop vac through a 5 gal. bucket vortex top and got 90% sucked up. 8 inch machine could be a little small for future work but is just the right size for my garage shop. I like the small footprint of a combo machine. Only took a minute to switch between jointer & thicknesser modes. Initial impression is very good, solid machine. Good design for a combo tool. Good design for a combo tool. The only problem I had was the blades were not set but after setting them the machine did all I could expect from a small benchtop modle. I like it and will use it a lot. This machine satisfies expectations as long as you keep in mind it's a 30" long, 60 lb. machine. So don't go looking to joint 8 foot long boards as if it's a 60" long, 300 lb. unit. But for drawer fronts and sides, home-made router table and cross cut sled fences, and the like, it's great! Also expect, as I've seen in reviews of all sorts of jointers, to spend two hours carefully setting the infeed and outfeed tables to being coplanar, and getting the blade heights set precisely to the outfeed table height. The adjustments to get the tables coplanar are not covered in the instructions, but the short story is: Take off the front and back covers and look for the four bolts (one on each side for each table) that can be loosened to adjust the tables. As with all jointers, do yourself a favor and don't call the tables and blades as being on the mark until you've thoroghly checked them out. Small differences make a significant difference. As a bench top unit and combo jointer/planer, this machine can't be beat! I heve had the jointer planer for about 6 months now and have used it many times. The blades seam to stay sharper than my other planer. I have serfaced about 150 board feet with real good results. The only issue I have is the dust port plugs up if the dust collector is not working. I have jointed maple, ash, cherry, and blood wood and it appears to happen with any type material. I have a very small shop and this unit works very well for me. It appears to be very accurate. The cut depth adjustment could be a little better, can't make real fine adjustments. I just got this unit and so far I like what I see. It took only about 30 min to put it together. I was looking for a unit that was light and could handle my projects. It appears to have a very good table. The unit is light so the fence and a couple other items are a little light. There are no fixed stops in the fence but adjusts very easily. Have not set it up and run it because of room. My shop is very small but contains many bench top tools. I am disabled so the weight of the tools is very important. So far it looks like an excellent tool, just what I was hopping for. BEST ANSWER: We do not ship to Canada at this time. We do not ship to Canada at this time. Does this come with a stand? If not can you recommend an open stand. BEST ANSWER: No, this is a bench-top planer/jointer. The recommended stand is model 707402. Yes, there is an optional stand available for this tool. BEST ANSWER: This product is new, not refurbished. It is currently on sale as part of a Spring sale. This is a new planer/jointer. How tall is it? From the base (bottom) to the top. I need to fit it on a table that rolls under a cabinet. BEST ANSWER: The height is 16.8 inches. Width and length are 18.1 and 33.5 respectively. The overall dimensions are 31" long x 16-1/2" wide x 18-1/2" high. 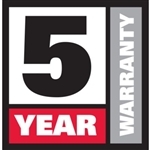 BEST ANSWER: Yes,for use in a non commercial or industrial purpose a 5 year warranty is included. BEST ANSWER: Currently we do not ship to Iran.